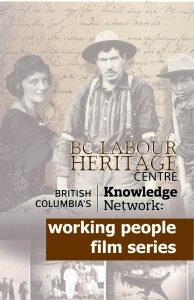 This award-winning series of 30 short films was produced by Landrock Entertainment through a partnership between Knowledge Network and the BC Labour Heritage Centre. Working People: A History of Labour in British Columbia explores the lives of ordinary people in the creation and growth of our province. This film references the existing economy prior to colonization and Aboriginal workers in the emerging industries of British Columbia. Gold Rushes attracted people from around the world to British Columbia. Although hopes were high, very few struck it rich. The focus in this film is the introduction of sternwheelers and steamships that allowed greater movement and mobility in British Columbia. An infamous name in British Columbia, particularly related to coal mines on Vancouver Island, this film presents a snapshot of working in Dunsmuir-run coal mines in the 19th century. Mattie Gunterman’s photograph collection is used in this film to capture early images of work and play in the interior of British Columbia. Through the story of Won Alexander Cumyow, this film explores the history and early experiences of Chinese Canadians in British Columbia. Through the story of the explosion at Coal Creek Mine in Fernie, this film examines the issue of child labour. A series of strikes rocked the fishing industry in Steveston, BC in the early 1900s. This story examines the efforts made to unite fishers across racial lines. An important and often unknown story of the town of Paldi, located on Vancouver Island, and the history of Indo-Canadian workers in BC’s forest industry. An historical look at female telephone operators in British Columbia and their early activism. This video focuses on early indigenous longshore union activity along Burrard Inlet. Named after the song written by IWW singer and activist, Joe Hill, this film is inspired by his words and organizing efforts amongst railway workers in the interior of BC. This film highlights the 1912-1914 Big Strike in Vancouver Island coal mines. A short profile of Ethel Johns, an important figure in the history of nursing in British Columbia. Looks at an important figure in BC labour history whose life and death continue to stir debate. A snapshot of work in early canneries in BC is presented through images and song. Talented photographer on Vancouver Island who made a living photographing loggers and fallers. His amazing photographs are featured in this film. In 1935, unemployed men took to the rails, with the intention of arriving in Ottawa. While they did not reach their destination, the protest lives on. In 1939, Connie Jervis, 24 year old president of the Langley Teachers’ Association, led a successful fight for an improved system of wages and compulsory arbitration. This film considers the events of 1938, when Relief Camp workers held a sit-down strike in downtown Vancouver. Life in a company town can come to an abrupt end if the company pulls up and moves elsewhere. This was the case for Ocean Falls on the North Coast of BC. From an early age, Margaret Rutledge knew she wanted to fly. Through her story, the history of women and aviation in BC comes to life. Tatsuro “Buck” Suzuki was a fisher and early environmentalist on the Fraser River who also played a key role in the return of interned Japanese Canadians to the coast after WWII. This film captures working life at Burrard Dry Dock during WWII, when women entered the workforce in unprecedented numbers. On June 17, 1958, the bridge under construction collapsed. In memory of the workers killed, the bridge is now known as the Ironworkers’ Memorial Bridge. Out of the loss of her husband to an occupational-related illness came one woman’s crusade for change. This film highlights organizing efforts by The Canadian Farmworkers’ Union. A union established to organize women workers in the 1970s—the Service, Office, and Retail Workers’ Union of Canada—is the subject of this film. In 1983, Operation Solidarity and the Solidarity Coalition came together to stage the largest protest in the province’s history in response to a series of proposed bills by the Social Credit government.